London is wonderful at the moment as Dan is looking at me from a lot of tube stations and that brings back really good memories. Not only from this wonderful film, but also from my time in New York where I saw it. 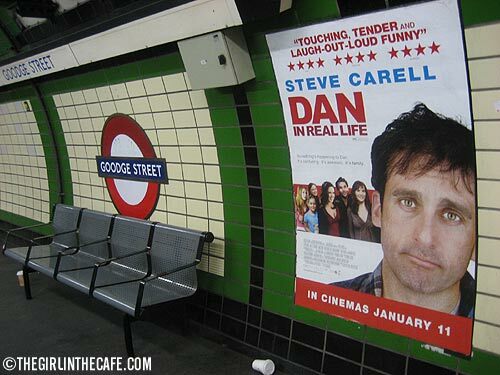 And honestly – wouldn’t you fall in love with the cute eyes of Steve Carell (though they are not as cute as you know who’s – don’t get any wrong ideas here) on this poster? I’ll say it one more time – go see this film. It’s the film you have been looking for (in vain) over the Christmas time, a true feel good movie. And I just know, that from the 11th of January (release date in the UK) I will see it an obsessive amount of times. Just so you are prepared. To be surprised. The last couple of days have been mental. Making a 60 seconds short doesn’t sound like a big project, but it is if there are 5 actors involved, not to mention the special effects and locations that will be integrated. It really is a 60 seconds feature action film. And one nice thing is that Julian, the actor I worked with on Persuaded, will return in this one too. He is a very kind man (and voicilicious) and I look forward to see him again. There is not a lot of dialogue in our 60 second short, so all those actors are just coming along for 1 or two lines and I can’t believe we are actually pulling this off. Tomorrow, while the rest of London is recovering from a hefty New Years night, we will drive to some of the locations (in that awesome Trabant) in London to do some camera tests, and to check where exactly we are going to film. Better to be prepared and know what we are doing before the actors come along. This coming weekend (5th and 6th of January) we will shoot everything (cross your fingers for not too bad weather) and then we have about 11 days to edit it. One slight problem being that we haven’t found an animator yet (we have a plan B though). Apart from being really busy with the 60 seconds short I also needed to get back to my feature script. When I picked it up I realized how much I had missed working on it. I love the story, and even if it never gets made into a film (99,9999% chance) I will never regret that I wrote it. I am currently rewriting parts of it to make it better, and that needs to be done in 2 weeks. I got another two lovely cards in my mailbox today, will scan them when I have the time. And through some simple twist of fate this day has turned into one of the best of 2007 for me, and it ends the year in a way that I can only be incredibly thankful for. Now, the big question is, now that I am in London on New Year’s eve, will I take my camera and walk to Westminster Bridge and watch the £100.000 worth of firework they are going to launch from The London Eye? Let me think about that for a bit. Have a great New Year’s eve, be careful with firework, and love each other, actually. Happy New Year – here’s to an exciting, challenging and safe one for us all. Happy New Year, dear Ingrid! I hope you are at Westminster Bridge, taking some great photographs. Today I watched ‘The Holiday’ which I enjoyed. Dan is cute. Your card has morphed into something quite different … I hope you will like it! Big hugs … and here’s to a wonderful, happy and year filled with lots of adventures, interesting people and some serendipity too! Hope you went to the fireworks, I saw them on TV and they were amazing! I tried, but there were so many people around that the queue started just around the corner where I live. I gave up and watched it on the telly too. The two police officers said that they had never seen this many people before on New Year’s eve.